Peltigera ponojensis: Gyeln., Mem. Soc. Fauna Fl. Fennica 7: 143 (1931). 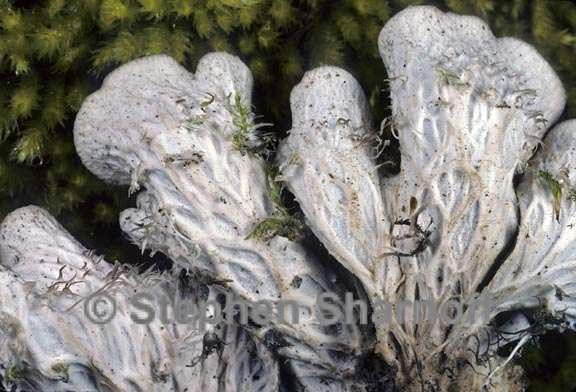 Thallus: foliose, approximately circular in outline, small to medium-sized, 5-15 cm in diam., adnate lobes: +flattened and elongate (1-2 cm wide and up to 5 cm long) imbricate or separate; tips: rounded to subtruncate, often ascending and undulate upper surface: gray or blue-gray to brown when dry, blackish green when wet, tomentose at margins, somewhat shiny, occasionally scabrose centrally, without isidia and soredia medulla: white, with +loosely interwoven hyphae photobiont: Nostoc lower surface: white, with anastomosing pale, narrow, raised and smooth veins, rhizinate rhizines: white, 3-7 mm long, simple or irregularly branched Apothecia: +round to oblong, flat or becoming saddle-shaped, on short, ascending lobes, up to 10 mm in diam. ; margin: smooth to crenulate disc: flat, dark brown to black, smooth ascospores: colorless to pale brown, acicular, 3(-5) septate, 45-65 x 3-5 µm Pycnidia: brown above, pale below, immersed, up to 0.6 mm in diam. conidia: colorless, bacilliform or slightly bifusiform, simple, 4-6 x 1 µm Spot tests: all negative Secondary metabolites: none detected. Substrate and ecology: among mosses over soil World distribution: temperate and boreal regions of North America, Europe and Asia Sonoran distribution: mid elevations in Arizona. Notes: Its pale, elevated veins and its pale, simple or little-branched rhizines are characteristic of P. ponojensis, but younger thalli may much resemble P. monticola, and their relationship needs to be clarified further.